I love flying kites. It's something I got from my dad, who always flew kites at the beach in the summer. On a good day he might have 4-6 kites in the air, handles buried in the sand, and he owned several stunt kites. The photo at the right shows a hexagonal snowflake, a delta with a sun setting over the water, and two dragons, Grandma and Grandpa. Grandpa is over 60 feet long (click for a larger photo). I especially love stunt kites, or kites that have multiple flying lines which allow you to steer them and do loops and tricks. I have four two-line stunt kites (although one is broken), and one four-line stunt kite. 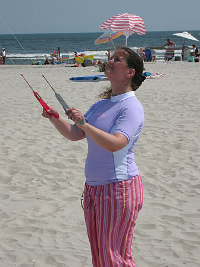 With a two-line stunt kite, you can use the two lines to steer it. Pulling on the left line turns it counter-clockwise, pulling on the right one turns it clockwise. 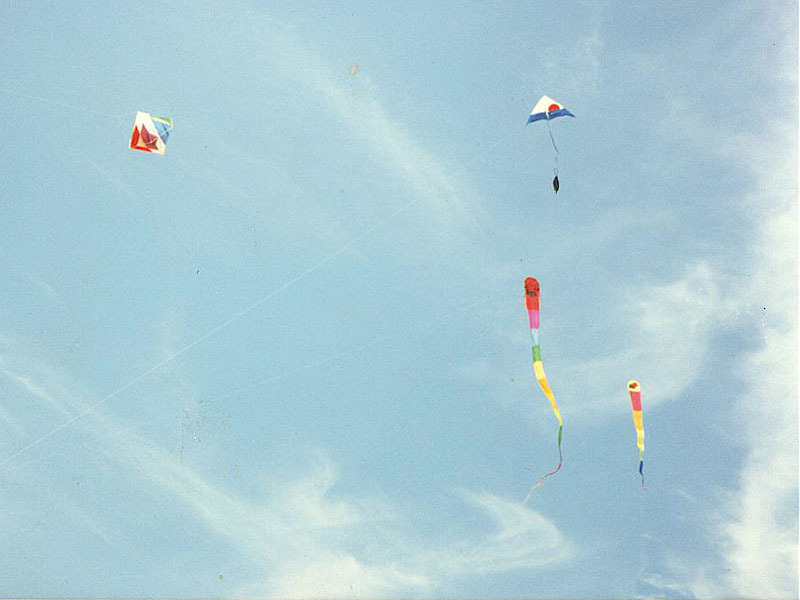 A four-line kite has hard handles, usually rods or bows, with lines attached to the top and bottom of each handle, and to the four corners of the kite. The added control allows you to move it up and down, rotate it in place, and fly it upside down, so you can do more tricks. 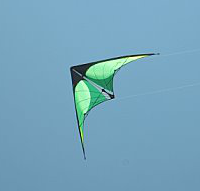 This is a common two-line stunt kite, a Delta (triangle). 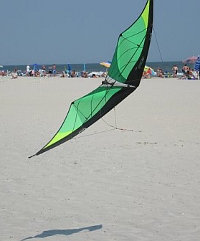 I like this kite because it's durable, it's easy to steer, and it packs up small so it's easy to transport. The Synergy Deca is made by Guildworks. It's a four-line stunt kite, so there are lines attached to each of the four corners of the kite, and the handles I use each have two lines, one at the top and one at the bottom. You can still pull your hands as a unit, like on a dual-line, but now you can also tilt your hands forward to slide it down, backword for up, or tilt your hands in opposite directions to rotate in place. Because you can control the angle of the kite better, you can also fly it upside down. A two-line stunt kite steers like a car - you can turn it left or right, but it always moves forward. The ability of a four-line to slide and to rotate in place means that you can do some nice tricks. Despite these cool properties, the Deca is more expensive and higher maintenance than the Revolution, and never became as popular, so they don't sell them in stores anymore. Guildworks has refocused on indoor installations and kite performances [YouTube video]. The Virtual Kite Zoo explains different shapes of kites, and also how to make them. They also have a page with links to good knots. Kite Flier's Site is a supplemental list of kite links for the rec.kites newsgroup. Kite Builder has replacement parts and materials for making your own kite. They also have forums and classes. Goodwinds Kites has replacement parts and materials for making your own kite. They also sell a pocket wind meter so that you can measure the current wind speed.